Craig Andersson, Dealer Principal of Sci-Fleet Hino Brisbane, Lewis Saragossi, Chairman and Managing Director of G.James and Bill Gillespie, General Manager, Brand and Franchise Development for Hino Australia. 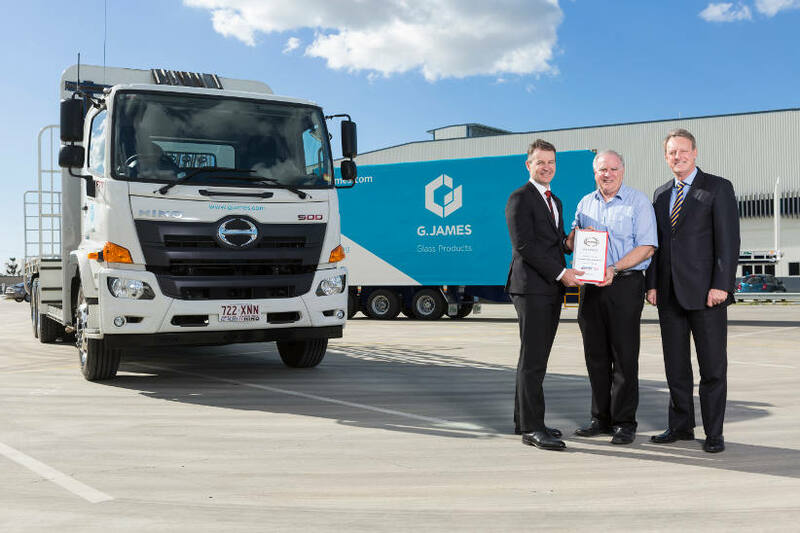 Market leading glass and aluminium manufacturer G.James has celebrated the delivery of its 100th Hino truck, with its 500 Series Wide Cab offering the perfect chassis combination along with unbeatable reliability. “Sustained growth over several decades has seen us expand from a single glass factory in Fortitude Valley to today having over 2000 employees operating from 35 locations,” said Lewis Saragossi, Chairman and Managing Director of the family-owned G.James group of companies, which utilises a total fleet of over 550 vehicles. With headquarters in Brisbane’s industrial hub of Eagle Farm, G.James produces a diverse range of aluminium and glass products, from solutions for skyscrapers, through to residential windows and doors, with subsidiary businesses in fields such as scaffolding, park and street furniture, and specialist aluminium castings. G.James products have found use in many noteworthy projects across Australia, including the Q1, Hilton Hotel and Circle of Cavill skyscrapers on the Gold Coast; One Central Park, the Chifley Tower and UTS in Sydney; the Epic Apartments and Swanston Square building in Melbourne; and also New Zealand’s Auckland Sky Tower. G.James’ Hino fleet is spread across the country from Cairns to Melbourne, Adelaide, Darwin and Perth, with the trucks configurated for differing roles, from specialist glass carriers, to flat beds for transporting aluminium products and medium duty trucks for local city deliveries. “We actually bought our 100th Hino in our 100th anniversary,” said Ian Malmstedt, Fleet Manager for G.James on the milestone for the company, which was widely celebrated in 2017. “It would have been late ’70s when we bought our first Hino, and they are always evolving into better vehicles. “One of the main reasons why I always prefer a Hino is that I’ve never replaced a Hino engine (which I have with other brands), so reliability is a big thing. Since the delivery in late 2017 of the 100th truck through Brisbane dealership Sci-Fleet Hino, G.James has ordered a further seven vehicles. Hino commemorated the 100th truck by presenting a plaque to Mr Saragossi from Bill Gillespie, General Manager, Brand and Franchise Development for Hino Australia and Craig Andersson, Dealer Principal of Sci-Fleet Hino Brisbane. The milestone order was a Hino 500 Series Wide Cab FM2628 XXL wheelbase model fitted with an Allison automatic transmission, with the chassis mated to a specialist glass-carrying A-frame. “We chose this truck because it was the right specification to perfectly fit a glass carrying body that we built in-house in 2003,” said Mr Malmstedt. Like many companies, G.James has committed to improved environmental practices, with several initiatives implemented from the manufacturing and product sides. Examples include the use of recycled material in aluminium extrusions, to glass and other plastic recycling, energy saving measures throughout the manufacturing processes, as well as water conservation procedures, and a focus on the production of environmentally friendly insulated glass. Powering G.James’ 100th Hino is a Hino J08 6-cylinder engine producing 206kW of power and 883Nm of torque, providing increased output, greater cooling, improved fuel efficiency and lower emissions. Enhancements on the engine of the 500 Series Wide Cab include a new turbo charger, revised water pump and cooling fan, while the new common-rail fuel injection system provides further efficiencies. The engine takes advantage of a Selective Catalytic Reduction (SCR) emissions system, conforming with the latest local and international emissions standards. The Hino 500 Series Wide Cab boasts the most comprehensive active safety package of any Japanese truck in the medium duty truck category – in an Australian-first for the class, Vehicle Stability Control (VSC) is fitted as standard across the new wide cab range. The Hino safety package also includes reverse camera as standard, anti-lock brakes (ABS), traction control, a driver SRS airbag, ADR84/00 Front Underrun Protection System (FUPS), Easy Start, Cruise Control and Fog Lamps. How do you address drug use in your fleet policy?